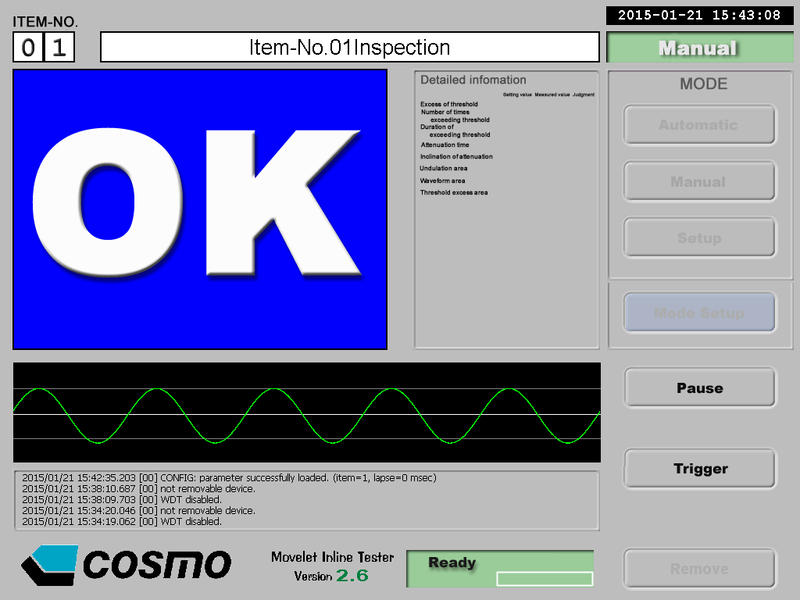 What is “Movelet” sound & vibration tester | COSMO LEAK TESTER / COSMO INSTRUMENTS CO., LTD. The “Movelet” captures the sound and vibrations generated from the object under test and conducts quantitative analysis to make judgments similar to those made based on the human senses. 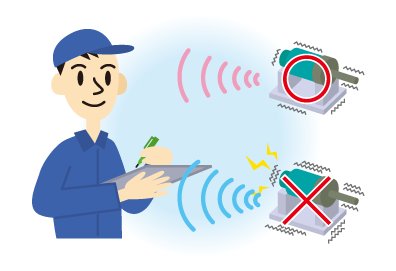 Also cracks can be inspected using the sound generated when the object under test is tapped. 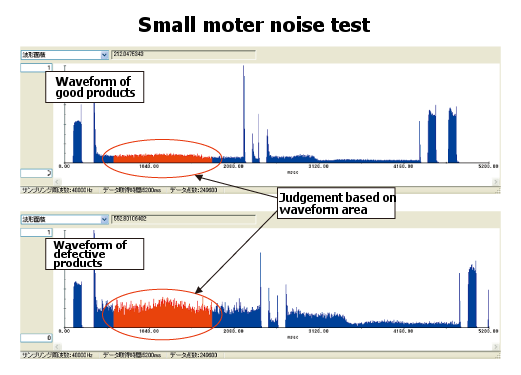 The “Movelet” can enhance specific frequency ranges by its unique analysis method, enabling inspections at noisy production sites with substantial noise. 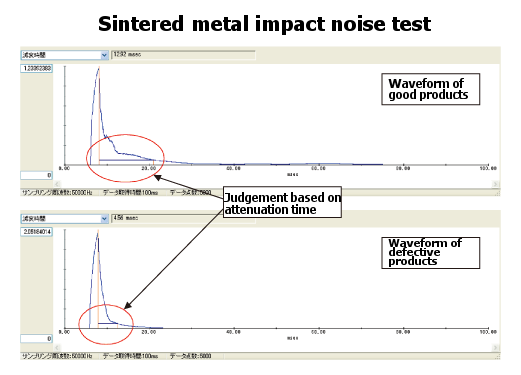 Conventional waveform analysis technique has such a problem that the result of analysis differs from that made based on human senses. The “Movelet”, by its unique analysis method, makes judgments similar to those made based on the human senses. 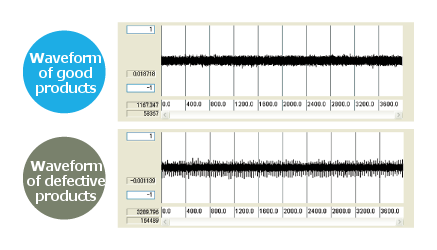 The conventional waveform analysis is broadly divided into time-series analysis and frequency analysis. 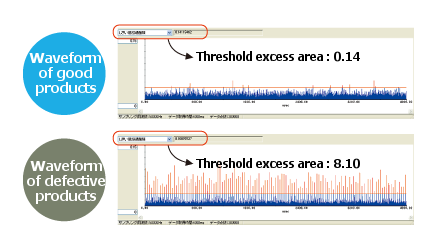 In the time-series analysis, chronological changes can be analyzed along the time axis.However, it is difficult to determine the causes of chronological changes. 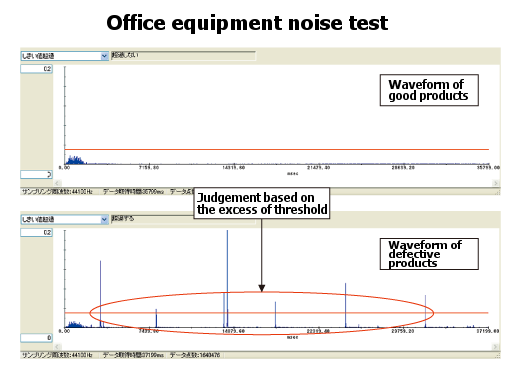 In the frequency analysis, the waveform to be analyzed is resolved into frequency components, and their respective amplitudes are analyzed. 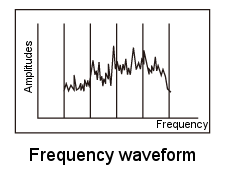 The FFT (Fast Fourier Transform) is typically used for the frequency analysis. 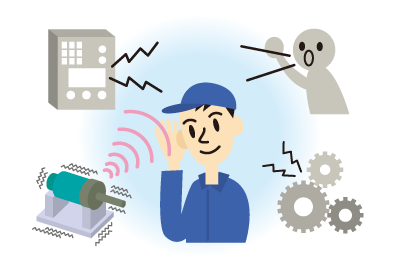 The FFT is effective to analyze respective frequencies since the data to be analyzed can be resolved into each frequency component. The concept of time does not exist in the FFT. Consequently the result of analysis substantially differs from the one made based on the human senses; such as the timing of amplitude generation is not reflected in the analysis result and the distinction between intermittent generations of large-amplitude and continuous generations of small-amplitude cannot be made. 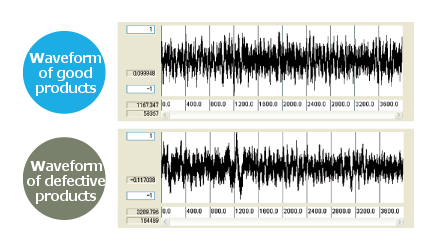 Waveform analysis by Movelet is an intermediate method between the time-series analysis and the frequency analysis. 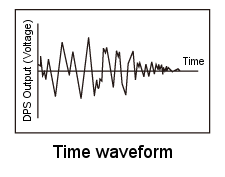 Analysis is made on the time-series waveforms obtained by enhancing specific frequency components (fluctuation conversion) for the input waveform. The fluctuation conversion processes and enhances specific frequency range components included in the raw waveform. This processing makes it possible to observe the chronological changes of specific fluctuation components invisible in the raw waveform. ●What is the evaluation/judgment similar to the one made based on the human senses? 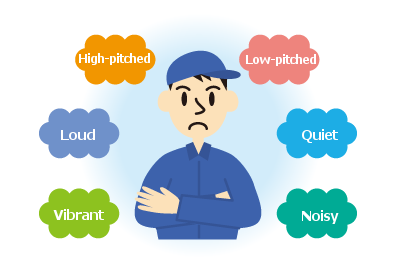 Humans can recognize certain sounds even in a very noisy place if they really want to hear the sounds. 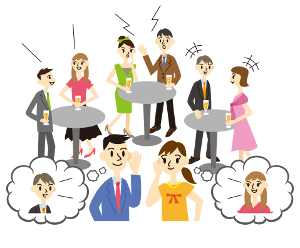 You must have had such an experience in a noisy party room or train station. which is achieved by the locations of sound sources and the frequency differences between different tones of the sound sources. In the same way, the Movelet extracts certain sounds from a mixture of various background sounds to make judgment. 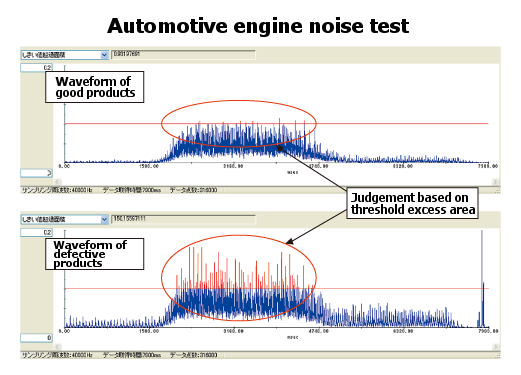 Enhancement processing of specific frequency ranges is effective for extracting noise components in noisy conditions. 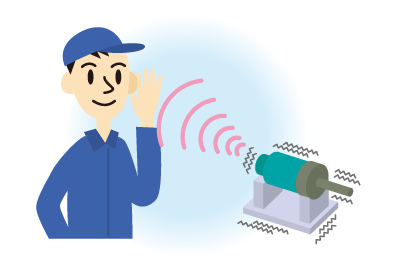 It allows inspection at production sites with substantial noise and vibrations. 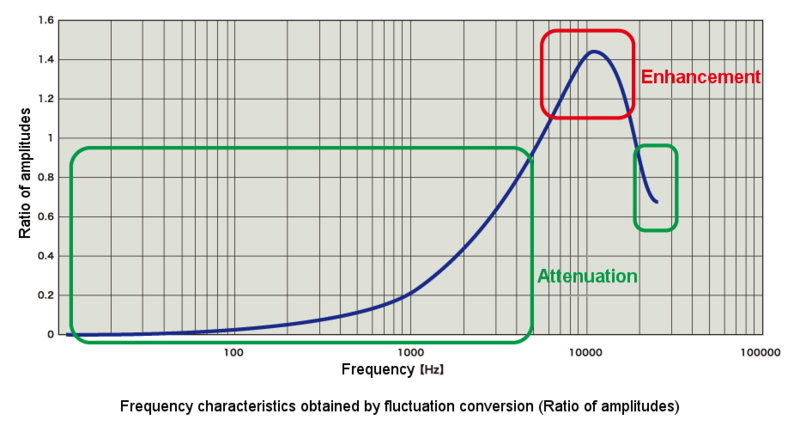 Enhance the specific frequency ranges by its unique analysis method. 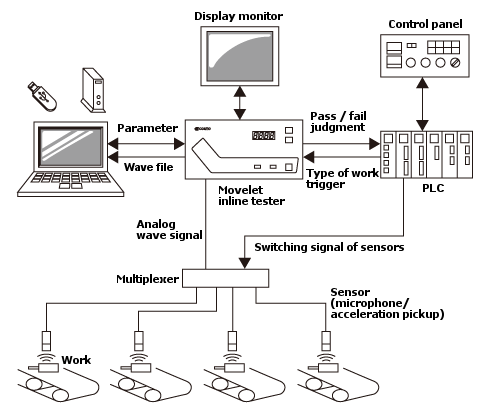 The amount of characteristics is a numeric value for quantitatively judging the waveform characteristics.The Movelet has 8 types of judgment criteria.Judgment using a single or multiple criteria realizes highly accurate testing.